The Ingenious (2019. 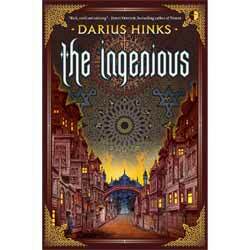 349 pages) is a fantasy novel by Darius Hinks. This is not like your average fantasy novel. Hink’s ability to mix the wondrous with the monstrous would not have seemed out of place in either a Thomas Pynchon or William Burroughs novel. Nor is Isten your average heroine. Strung out on drug for much of the book, Hinks is able to add in hallucinatory images which take the whole book further out there. The book is set in the city of Athanor, which is able to relocate itself. When it lands, it trades with the locals and when it leaves it takes part of the environment with it. This means that after thousands of years the city has grown to monstrous proportions, containing within it multiple species and architectures. The city is ruled by the ‘Curious Men’ who through alchemy/science are able to both move the city and create powerful metal guardians. Both the city and how it works is sketchy at best. Having finished the novel I felt that I had barely scratched the surface and my understanding remained incomplete. This is probably deliberate as it gives the reader the same sense of disconnection from the greater whole, which seems to be experienced by the cities inhabitants. The overriding sense of disorientation start right at the beginning as the reader is just dropped into the plot. Isten seems to be an inconsistent narrator, torn between her drug use and her apparent desire to get all of her friends back to their original world. To this end there is nothing she would not do including murder and running illegal rackets. She sounds like an unlikable character, but she is more broken than evil. The accumulation of these elements means that this is a very dark book. Hinks convincingly captured both the lure of addiction as well as the inevitable problems of withdrawing. This may not sound like it would be a book for everybody, but I would suggest you try it. In a world being buried by faux medieval settings and kids with destinies, it’s refreshing to read something truly original.